Do you like to work with people? Do you enjoy science? 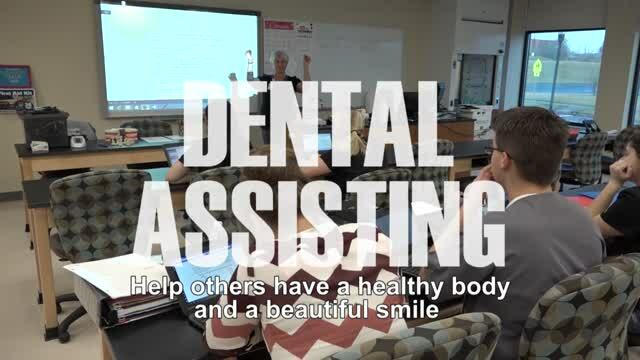 Check out the Dental Assisting program. You’ll learn to work with patients as part of a team of health professionals, using the equipment you’ll find in a dental practice and lab, and can earn your certification to begin a career right away and also be prepared for further education. Students will learn general dental assisting skills, including patient interaction, preparing dental restorative materials, identifying and using dental instruments, and dental terminology. Students will spend lab hours practicing chair-side, infection control, and basic laboratory skills. Job shadowing is included to gain exposure to working in dental offices. Students will also participate in SkillsUSA, a Career-Technical Student Organization. This program is located at the Greentree Health Science Academy, a state-of-the-art medical training facility near Atrium Medical Center. Students are transported from WCCC to the academy for their lab work. Dental Assisting students participate in SkillsUSA, a partnership of students, teachers and industry, working together to ensure America has a skilled workforce. All students also have the opportunity to participate in the Tech Prep Showcase through the Miami Valley Tech Prep Consortium. For more information, call Instructor Holly Todd at 513-933-3960 or Holly.Todd@mywccc.org.